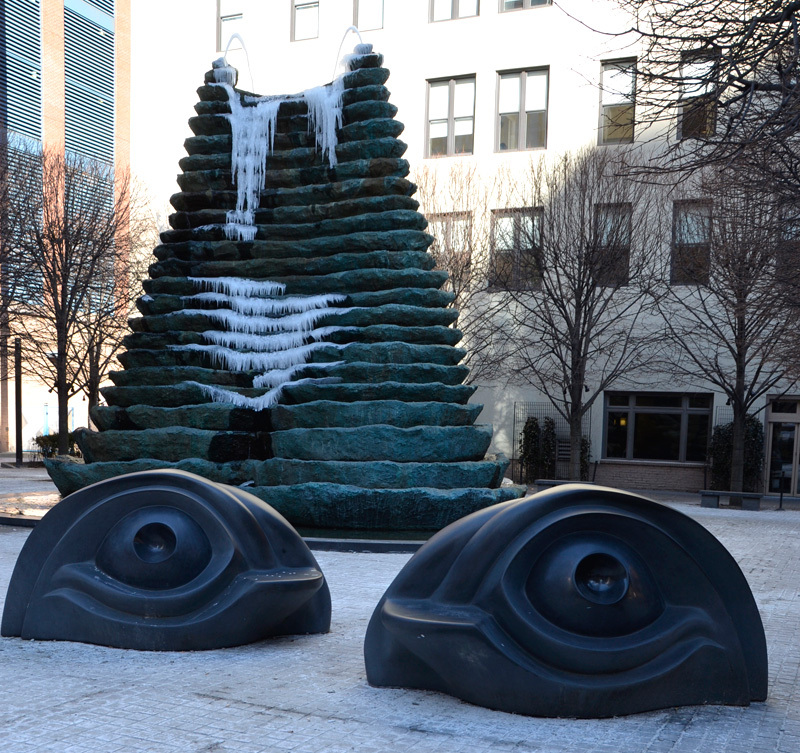 While the sculptures in this plaza are the work of Louise Bourgeois, the plaza itself was a collaboration between the artist, landscape architect Daniel Urban Kiley, and Theater Square’s architect Michael Graves. 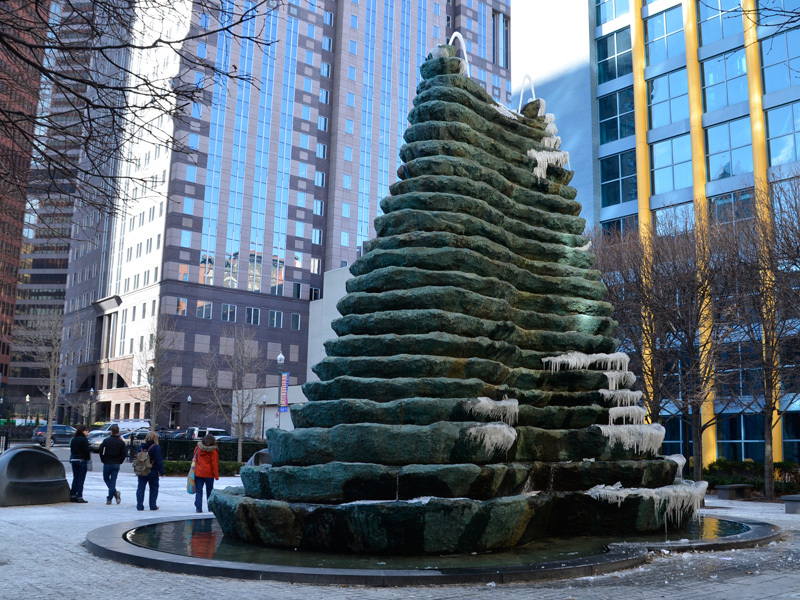 The 25 foot high fountain that takes center stage here has heated water, allowing it to be one of the few fountains in the city that stays on all year. 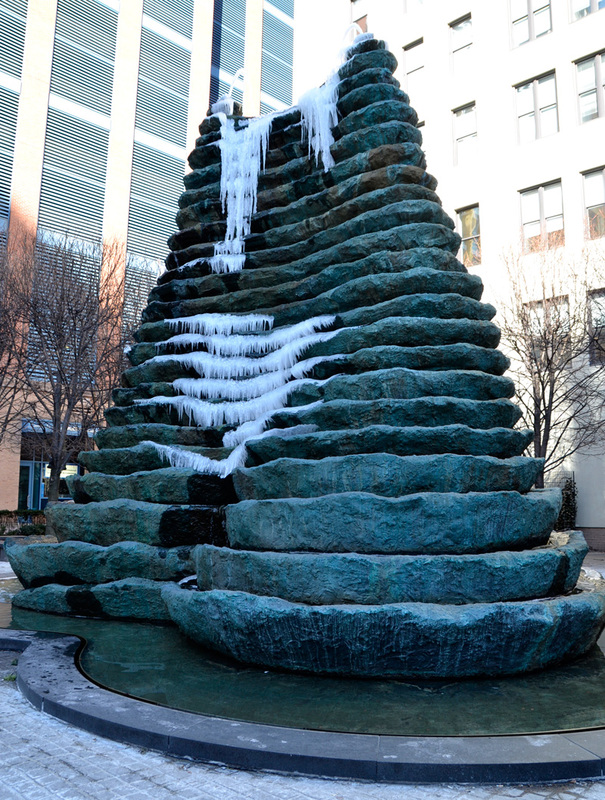 Even the cold winter we had for the 2013–14 season wasn’t enough to stop the water from flowing. The Pittsburgh hills inspired its shape, and in New Landscape Design, Robert Holden says the surrounding pool edge is intentionally small so that viewers can get close to the sculpture ." 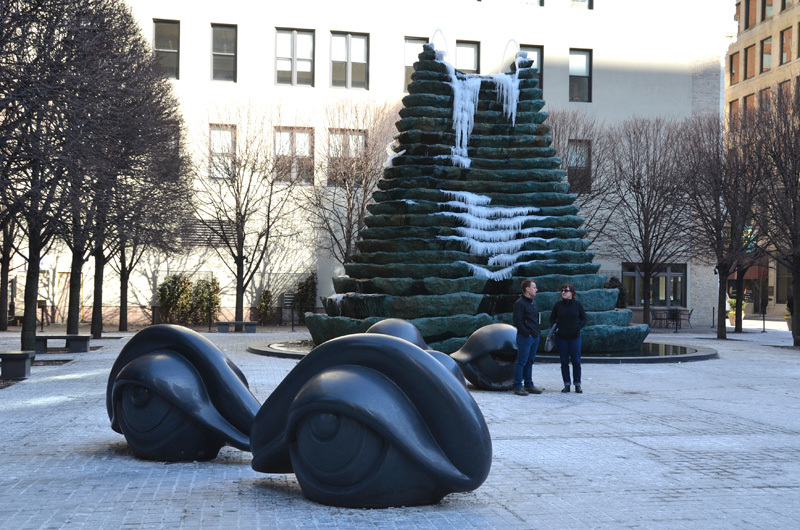 A Post Gazette article from the dedication of the plaza in 1999 (written by Caroline Abels) quotes Ms Bourgeois’ assistant as saying that the artist intended the two streams of water to represent a couple whose lives mesh. Around the plaza there are three different pair of benches in the shape of huge eyes. There are other simple granite benches throughout the parklet, but these are well, (forgive me) eye catching. While they are not unique to this plaza any longer, they were originally designed specifically to complement this fountain. In 2006 the artist donated copies to the Olympic Sculpture Park in Seattle, to be positioned around another fountain that she designed. Ms Bourgeois made several versions of eye shaped benches. Eye Benches IV (which she loaned to New Orleans in the wake of Katrina), have lights in the eyeballs. We were unable to find any reference to a title for the fountain. In fact the only reference we found to a title for the benches were in the articles about the Seattle sculpture park, where they are named Eye Benches I, II, and III. The titles for the artwork might have been overshadowed here by the name of the Plaza. Agnes R. Katz plaza was named after a local supporter of the arts. Her children donated much of the funding for the plaza and did so in her honor.